The Jurassic rocks in the northern Canelo Hills can be grouped into four stratigraphic units (in chronological order): 1) red mudstones, 2) a sandstone and conglomerate unit, 3) a sequence of welded ash flow tuffs, and 4) a coarse conglomerate unit. The clastic units contain large exotic blocks of Paleozoic rocks. These rocks have been referred to as the "lower" Canelo Hills volcanics, but map relationships indicate that they were deposited on top of the "upper" Canelo Hills volcanics. 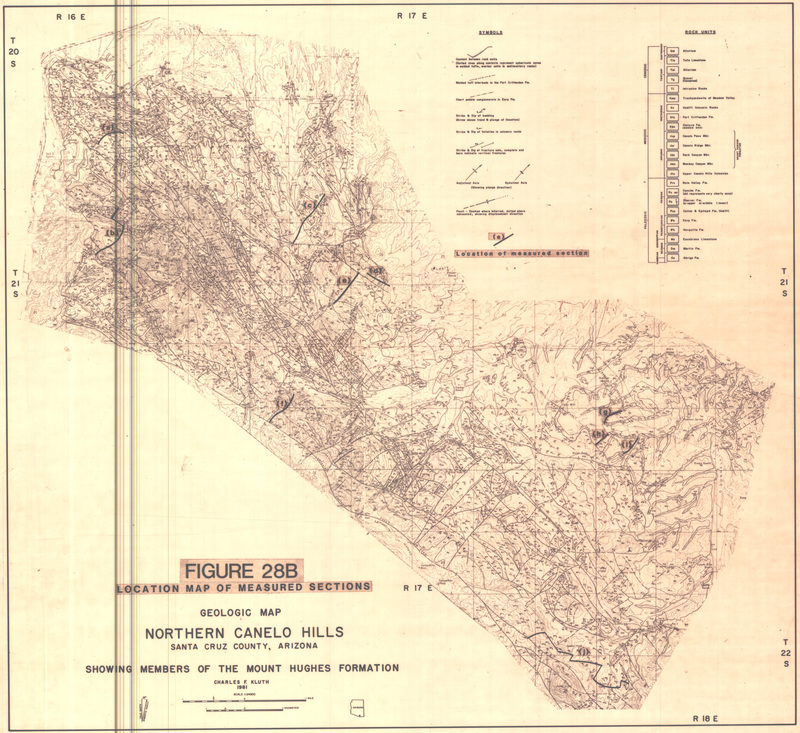 Therefore the old nomenclature should be abandoned and the "lower" Canelo Hills volcanics is herein renamed the Mount Hughes formation. The Rb-Sr isotopic age for welded tuffs within the Mount Hughes formation determined for this study is l50.5 ± 2.5 m.y. This age is concordant with published dates (K-Ar, Rb-Sr) from correlative rocks elsewhere in the Canelo Hills. Paleomagnetic data suggest that two reversals are present in the sequence with a pole position of lambdap = 62.2°N, phi(p) = 130.3°E, with d(p) = 4.1° and dm = 7.4°. This pole suggests an episode of rapid apparent polar wander for North America during the Middle to Late Jurassic. The northern Canelo Hills are comprised of a structurally-high, fault-bounded, central-block of Paleozoic and Jurassic rocks that are folded into a faulted, northwest-trending anticline. Structurally lower blocks of deformed Cretaceous rocks bound the high central-block on the southwest and northeast across reverse faults. The large structures in the northern Canelo Hills reflect southwest-northeast Laramide shortening. A few northeast-striking faults are Jurassic in age. The revision of the stratigraphy within the northern Canelo Hills requires revision of the mid-Mesozoic stratigraphic framework for southeastern Arizona. The new framework has two lithotectonic units: a lower, volcanic sequence and an upper, coarse clastic unit. The present work suggests the following tectonic history of southeastern Arizona. A Triassic (?) to late Jurassic continental volcanic arc was deposited on Paleozoic marine shelf rocks. A coarse clastic sequence that reflects continental rifting was deposited in the Late Jurassic to Early Cretaceous over the arc terrane. Shallow seas transgressed the area in Late Early Cretaceous. Laramide compression affected the area in Late Cretaceous. Kluth, C.F., 1981, The Geology and Mid-Mesozoic Tectonics of the Northern Canelo Hills, Santa Cruz County, Arizona - Geologic Maps. Arizona Geological Survey Contributed Map CM-15-B, 2 map sheets at scale 1:24,000, 2 plates: location map for measured section, measured sections. The maps and measured sections were scanned from mylars resulting in legible plates.